Junior hospital doctors are refusing to back off in their fight against the government’s scheme to impose a new work contract. The BMA has announced strikes for March 9, April 6 and April 26. Each will last for 48 hours — double the length of previous action. As always, the doctors will continue to carry out emergency care on those days. Jeremy Hunt, the Health Secretary, is pretending that the issue at stake is doctors sabotaging plans for a seven day health service. In a blatant propaganda war against the doctors, he’s tried to imply that they are refusing to work extra hours and are therefore responsible for the dubious figure of 6,000 deaths per year due to a lack of hospital weekend staff. This is just an outright lie. The figure has been plucked from the air. The doctors are not refusing to work weekends. They are not blocking plans for better hospital care. They are opposing Hunt’s arbitrary attempt to make them work longer hours for less pay. Essentially the government’s plan is to redefine what constitutes normal working time. Under their current contracts junior doctors are paid a basic salary of around £22,600. At the moment they are paid extra for working after 7 p.m. on weekdays and at weekends. The new contract would extend ‘normal time’ to 10 p.m. on weekdays and 7 p.m. on Saturdays and the doctors could be obliged to work more nights and weekends without being able to object. In terms of take home pay it means a wage cut of around 30% to 40%. On top of that, they will only be entitled to one 20 minute break every six hours. These are familiar bosses’ tricks which workers in other jobs will easily recognise. No wonder the doctors are turning to strike action: withdrawal of labour is the ultimate weapon for wage workers everywhere. Welcome to the class struggle! 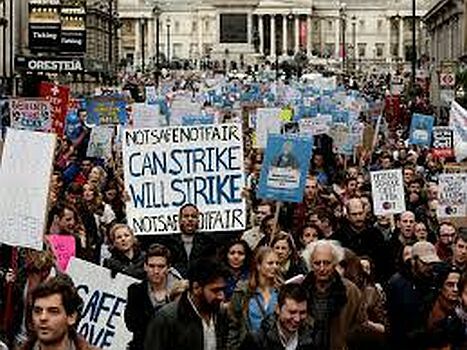 In truth this is not the first time junior doctors have been moved to strike. In 1975, in the early stage of the economic crisis that has been dogging capitalism ever since, junior hospital doctors struck for the first time. During the winter of 1974/75 the working class was seething. With inflation around 25%, more and more workers were striking just to try and keep up the real value of their wages. Airline workers, lorry drivers, steelworkers, engineering workers, fire crews, teachers, bus drivers, were just some of the groups who took to the streets over their wage claims. In the NHS the taboo on strikes had already been broken when ancillary workers struck against a pay freeze in 1972 and nurses and radiographers followed suit in 1974. By 1975, in a remarkable parallel with today, junior hospital doctors were resisting the introduction of a new contract by Barbara Castle (the Labour Government’s Social Services minister) which would have reduced their overall pay. Back then, however, their struggle was tangled up – at least by the BMA and the gutter press – with the consultants’ campaign to maintain their lucrative private practices at the same time as work for the NHS and the GPs who threatened mass resignation if they didn’t get a 30 per cent pay rise. In the early years of the capitalist crisis the working class did not imagine the scale and depth of the attacks that were to come. There was massive anger and willingness to fight but, as always, this was corralled by the unions into a section by section fight with no larger aim than for each group of workers to hold on to what they had. This was impossible. The capitalists were now ready to attack workers head on in their bid to raise profit rates. Sectional divisions and the low level of political consciousness within the working class allowed the bosses to get away with unprecedented economic restructuring which ushered in the era of globalisation and digital electronics. Over the last 40 years or so the shape of the working class has changed as the old heavy industries have gone. But far from the working class ‘disappearing’, new layers of professionals, like the junior doctors, have unambiguously joined the ranks of wage workers and are facing the same kind of attacks as the working class in general. Contrary to what sociologists and academics tell us, Karl Marx’s prediction of the decline of the middle class professional living on an income from fees for services rendered is now confirmed. Nowadays most ‘professionals’ depend on having to turn up regularly to a workplace to sell their labour power in return for a wage. This is not the only one of Marx’s predictions that is being borne out. Today the capitalists themselves admit their system is facing a bigger economic crisis than ever before. Marx’s insight that capitalism’s drive to increase profits leads to ever-wider and deeper economic crisis where wages are driven down and unemployment rises has passed the reality test. Above all, Marx recognised that capitalism’s economic development in itself would not lead to a golden future for the majority of humanity. Yes, capital has created the material foundation for a world without the threat of poverty, war and famine. What’s more the majority of people in the world belong to the global class of wage workers with no property interests of their own to get in the way of organising together to produce directly for human needs. But the capitalists are not going to let go without a fight. One of the most important insights of Marx today is the lesson he drew from the Paris Commune, way back in 1871, which is that the working class cannot simply take hold of the existing state machinery and reorganise society on a communist basis. Yet the social democratic illusions remain, if not in the possibility of communism through parliament, more often in the possibility of reorganising capitalism to the benefit of the working class. But no amount of momentum for Corbyn or any other left capitalist party can solve the capitalist crisis, much less perceptibly modify the attacks on the working class. The doctors have a lot of public support – none of us wish to be treated by dog-tired, demoralised doctors. But this needs to be turned into solidarity action, not just across the NHS, but from the wider working class. If nothing else, the last few decades have shown that the outlook for the future will only improve when each group of workers under attack recognises that their battle is part of wider class struggle for a new world. The working class needs to have a vision and see the practical possibility of a new society: the only civilised and progressive response to the world capitalist crisis. The Communist Workers Organisation is a working class political organisation whose militants aim to bring a wider revolutionary perspective to struggle. We are ready to work with anyone who shares our vision and who is tired of having their efforts defused and wasted in reformist campaigns and single issue struggles. It’s noticeable that junior doctors have been involved in many of the Marxist study groups which have arisen since the financial crisis. As we offer the doctors our solidarity we are confident that a number amongst them already recognise that theirs is a fight which goes beyond ‘saving’ what’s left of the NHS. This article includes for me an interesting juxtaposition as follows. Yet the social democratic illusions remain, if not in the possibility of communism through parliament, more often in the possibility of reorganising capitalism to the benefit of the working class. ... the working class cannot simply take hold of the existing state machinery and reorganise society on a communist basis. And this is because the existing state machinery is there in the form best suited to capitalist relations of production. To imagine these can be reformed is precisely the social democratic illusion. Under communism there will be no state. Emancipated workers planning production and working together throughout the world will have dumped that in history's dustbins along with the rest of capitalism's outmoded claptrap. Looking at Charlie's comments, is it not the case that actually capitalism has to adjust all the time slightly to keep the working class operating, otherwise its system would collapse. Also, in the event that capitaist states are overthrown, surely there is a difference between not taking them over and not having any sorts of states at all ? One certainty about capitalism is that it is chaotic, but a steadily changing and threatening chaos, whereas the sort of scenario imagined by the ICT seems to possibly lead to a sort of static chaos, in which rules and regulations and laws and means of proletarian governance are largely unclear, with workers unclear as to who, if anybody, is responsible for anything, remembering the view from Stalinist times that 'they don't pay us and we don't work'. ICT does not intend that money should be used anyway, so planning the relative values of materials needed for all sorts of production would be a whole new ball game. Ah but hey presto ?! It was inspiring to be alongside the young doctors with their banners outside the local General Hospital this morning, 26-04-2016, and to chat with them. From a small set of equipment the sound of Jelly Roll Morton playing 'Doctor Jazz' was well received, whilst being aware of the serious issues on which they were striking. Some of various Marxist views were also briefly discussed, in the cold wind. Let's hope the sun will shine for them tomorrow on their side of the street. Your support for the young over-exploited doctors is to be commended T34. Especially out in the cold. But I for one would love to hear about the nature and content of the "various Marxist views" you said were discussed, though briefly. After all one doesn't generally associate professionals like doctors with Marxism, although the article shove suggests their on-going plunge into the ranks of the proletariat as the crisis bites deeper and more frequently, and as they are perhaps brought into closer contact with the biting winds of decaying capitalism with its cut-backs and continual repression of all ideas and thought. It would be appreciated and be most helpful if you could oblige T 34. Thank you. and Best wishes, Charlie.